Divide the mix into 3 and add colour to each bowl. Put a spoon of each coloured mixture into each wrapper. Pipe Cake Angels Zingy Lemon Frosting on top, then add Rhubarb and Custard Sprinkles. Add a swirl of pink buttercream. Create a mane by piping Cake Angels Zingy Lemon Frosting on the top of the strawberry frosting to the top of the cake case. Decorate with Rainbow Sprinkles. Cut out small hearts for ears from the white fondant and place upside down onto the pink buttercream. 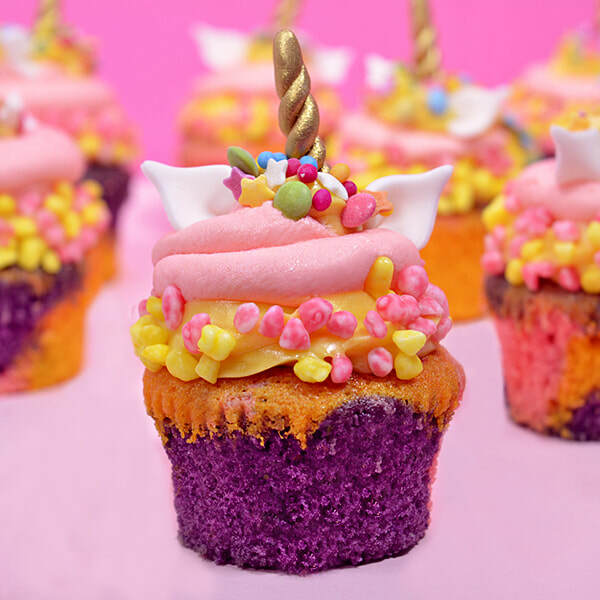 Make the unicorn horn by using rolling white fondant icing into sausages then twist to make a point. Allow to harden and dust with gold lustre dust then add to the top of the cupcake. Inspired by retro sweet shop flavours, our delicious Rhubarb and Custard sprinkles are perfect for jazzing up cakes, cupcakes and other sweet treats. Or eating straight from the jar. Don't worry, we won't tell! Dive in and get decorating. Ingredients: Sugar, glucose syrup, flavourings, glazing agent (shellac), acidity regulator (citric acid), concentrates (radish, carrot and blackcurrant), colour (curcumin). Energy 397kcal, Fat 1.7g, of which saturates 1.6g. Carbohydrates 98g, of which sugars 96g. Fibre 0.1g. Protein 0.2g. Salt 0.1g.